Most Valuable Muscle Building Protein : By combining the absolute finest ingredients with a series of highly specialized processing techniques it has created its most valuable muscle building protein . Everything about WHEY HYDRO-X was designed with an uncompromising attitude toward performance – both in the gym and your shaker cup. 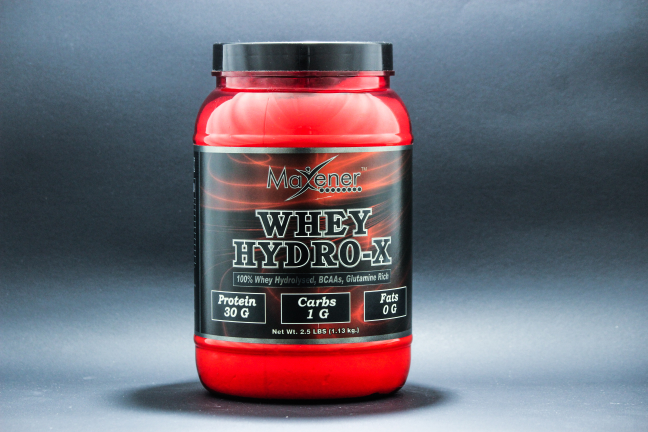 Feed Yur Muscles Fast: 100% of the proteins in WHEY HYDRO-X are hydrolyzed to varying degrees. Hydrolyzing is a process through which intact proteins are strategically broken down into smaller fragments, called peptides, for faster delivery and easier utilization by your body. MAXENER’s exclusive combination of mild, moderate, and ultra-hydrolyzed proteins provides di-, try-, and oligopeptides while retaining select microfractions naturally found in whey.All proteins are made up of amino acids, but not all amino acids are of equal importance. The essential amino acid are important as they are not made in our body and are needed from external sources and this are particularly beneficial for athletes because they assist with new muscle synthesis and protect the muscle that you already have against breakdown. * That’s why MAXENER enhanced every serving of WHEY HYDRO-X with added 5 gm of glutamine to each scoop.